I am an abstract painter. I do not usually paint to "re-present" existing people or objects. I believe that works of art, or works in a series, are not imitations, or tricks, and should not simply stand in for another (worthier) object, the painting of the golden bowl a simple study in skill. The painting is, itself, the thing. My husband and I, who generally agree on things artistic, have these discussions. I have always thought that art should be about "something," that there must be a subject matter; most of my painting heroes argue along these same lines: Motherwell created the Spanish Civil War series, and Agnes Martin, the "perfect space." Painters like Helen Frankenthaler and Joan Mitchell have been too easily dismissed because critics said that their work was not about anything, that it was too lyrical, too beautiful.... A shudder dismisses the work and then passes through all of us. We all approach the studio with an idea, I believe. But Charley says that art can be, simply, beautiful, gestural, with no "three o'clock on a Tuesday afternoon in Taos," even in an abstract vein, about it. Rothko, he says, may have believed that certain of his works were violent, but it would be difficult to convince viewers -- who see the colors floating on the canvas -- to find that same intended violence. Art is about the way the piece itself meets its viewer, ultimately. And Charley has some pretty impressive artists who would appear to be on his side; isn't Pollock's work largely "about" the painting itself? Picasso was loathe to release the work from his studio because then it was out of his control. And Bruce Nauman wrote somewhere that "whatever I was doing in the studio must be art." (That's WHATEVER, equalling art). So I would say, the painter is delineating the tree branches perfectly (what Bell refers to as demonstrating "seasonal opulence"), yet he then gives us a pattern, in what seems to be an anticipation of Klimt, to show us the flow of the river, then he allows an entirely abstracted gold-leaf ground to stand ... itself signifying "nothing." So we have the full movement from representation to abstraction, from intentional rule and role-playing to throwing over all the rules. So then Bell talks about Dong Qichang, from China. Dong had argued that a painter named Ni Zan, who painted, he said, "merely to sketch the exceptional exhilaration in my breast" (139) could be seen as perfectly right in his (oh-so-loosely-representational) idealism, which, Bell writes, meant that Ni Zan, in Dong's theory, "kept a judicious, culturally well-informed distance from the crude imprint of the immediately visible" (266). I love that sentence of Bell's. Wow. The "crude imprint of the the immediately visible." It's pretty tempting to leap right into that, but I can't, really. Maybe it was Pratt, Kansas? And I'm not sorry about it either. I'm only what I am -- and I'm free to live the minutes as they come to me -- if you know me at all you must know me as I am. The night is very still." (from Roxana Robinson's "Life," p. 185). This is Georgia O'Keeffe at her best: honest, feisty, serious. I love this about her. The Georgia O'Keeffe Museum in Santa Fe, New Mexico is currently showing only a few of her works, including a gorgeous painting that I had never seen before, called "A Street," from 1926. The painting doesn't portray the street at all, only the sky between two skyscrapers, with a streetlight one of the only clues to the realism of the work. The museum labels quote O'Keeffe as saying that she noticed that, as taller and taller city buildings were constructed, people looked at them, because they were so large. She said she thought that she could perhaps allow people to see flowers with the same attention if she made them large, as well. And they did start looking, she said. The show also has a copy of David Hockney's Secret Knowledge on display -- the use of lenses, Hockney argues, shows up earlier and more universally than anyone had previously argued. Fabulous book and very compelling theory. This show should be seen. It is fine. "... the difference between things..."
--the (artistic) borders we create, that make one surface seems different than another, "between things"
You can't see an Agnes Martin -- not really -- unless you are standing in front of it. She doesn't reproduce well. There aren't many catalogues in existence. It's a rare thing, her work. There are painitngs of hers in the Tate, in the Metropolitan Museum in NYC, at SFMOMA ... those are the ones I know about. Go and see her stuff. Come to Taos and see this room. She's amazing. You will know by now all about the newest San Francisco Museum of Modern Art (SFMOMA) show, called The Steins Collect: Matisse, Picasso, and the Parisian Avant-Garde. I quoted from the catalogue yesterday, which I now have and am slowly looking through ... the show is wonderful. It begins here and moves to Paris and New York. There are drawings, paintings, pieces of furniture, letters, plans by Le Corbusier, photographs and the collections are gathered together in the museum as they were acquired and displayed in each home ... this will not be happening again! The show helps explain the way the Steins' purchases and salons helped encourage the understanding and reputation of the newest wok of the twentieth century. Do go if you possibly can! Leo had Cezanne, Gertrude Picasso... one apple for five! When Leo Stein left Rue du Fleurus, he and his sister Gertrude had to choose the pieces each wished to keep from their joint collection. Gertrude kept most of the Cubist works, and the Picassos, and Leo the Matisses and some of the older works. But they both loved the Cezanne sketch, "Five Apples." Leo prevailed, saying "The Cezanne apples have a unique importance to me that nothing can replace.... I'm afraid you'll have to look upon the loss of the apples as as act of God." Gertrude was not without resources, however, and when Picasso learned of the story, he painted Gertrude and Alice a replacement apple, and gave it to them for Christmas 1914. (Recounted in The Steins Collect, edited byJanet Bishop, Cecile Debray, and Rebecca Rainbow, SFMOMA and Yale University Press: 2011, p. 97). (which means, as the French would say, "let the world say what it will"). Virginia Woolf wrote (in A Room of One's Own, I think) that the world is filled with those who have "minded beyond reason the opinions of others." It is good to mind within reason, but too often, we artists do mind "beyond." So, with the French, I say les chiens aboient, la caravane passe. Look at the lines. There is a frantic, circular repetition to this sketch. 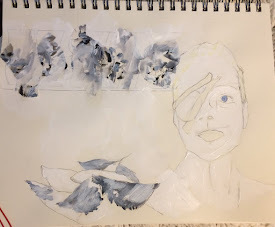 The face is pretty intact, but the feeling that this piece conjures up, at least for me, is changing, busy, unsettled, anxious... Bacon chooses to let the figure move against a flat ground ... not just here, but most of the time. So I ask myself, what if it were the other way around? What if the figure were still, and the ground moving? Because, as we move through the air, the air appears to move... we think of ourselves as intact. The struggles tend to remain inside. Bacon exposes them. But what if the air responded, instead? What if the surroundings were the sopurce of energy for the painting, and what was "background" comes to the "foreground"? 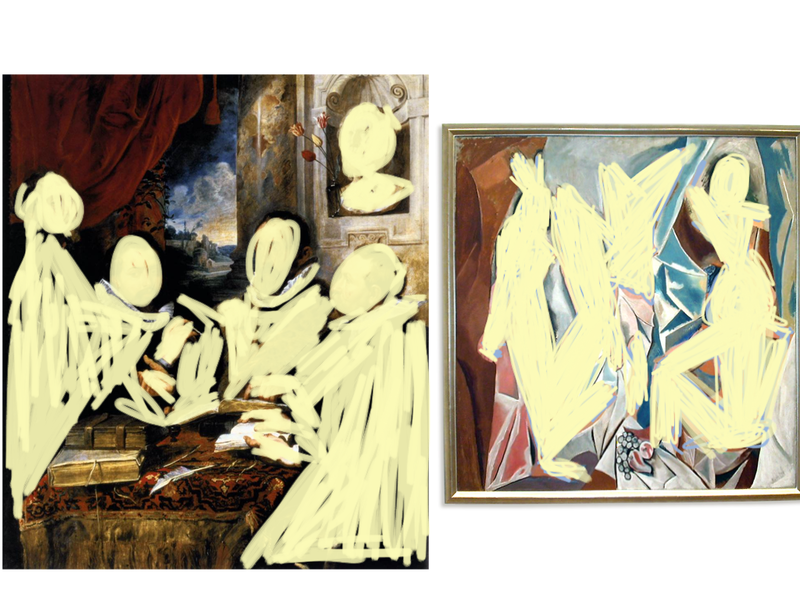 Take the comparison of Rubens and Picasso from a few posts back (April 26) and block out the figures from each... what survives here? In the Rubens, the lovely view out of the curtained window. it still seems to calm and distant, too much a reminder of its former status as... filler? In the Picasso, a great deal stays with us. Look at the energy of his "ground" as it becomes figural, here... look at the lovely slices of blue, nearly vibrating... The whited-out Demoiselles are pretty angular and bold, but they fight, now, for space and for the sense of movement offered by those slices of sky and curtain. He could have gone abstract. It was always an option. and out of rudeness comes rapid same question, out of an eye comes research, out of selection comes painful cattle ...." (from "A Box" from Objects, from Tender Buttons, by Gertrude Stein). Gertrude Stein says "It is not clarity that is desirable but force. Clarity is of no importance because nobody listens and nobody knows what you mean no matter what you mean, nor how clearly you mean what you mean. But if you have vitality enough of knowing what you mean, somebody and sometime and sometimes a great many will have to realise that you know what you mean and so they will agree that you mean what you know, what you know you mean, which is as near as anybody can come to understanding any one." Years ago, we went to see Stein's house in Bilignin. At the time, it was lived in, and the residents were not willing to take us indoors, but we did walk along the terraces, and see the views and the gardens. It was beautiful. Afterwards, we drove down to the road below and took a photo of the house (below) and remembered what we had read, once, about the way residents of the town loved her and sheltered her in World War II: one of them said "credit for her until hell freezes over." The eyes – somehow stylized, somehow completely each man or woman’s own – astonish, even in the dimmed light (of the quietest room) of the Getty Villa at Malibu (where a few of these pieces rest; others are scattered, or in the Louvre... or not yet found). Each face belongs to a Greek man or woman living in Roman Egypt; each gaze is confident, vibrant, direct and beautiful, the sitter accomplished and mature, dressed in his or her best, and yet ... both artist and sitter know that the final painting will be wrapped together with a funeral shroud. These are death masks, mostly egg tempera on wood, buried and later, the wooden portrait was separated from the body by -- thieves? The works contain cracks, an awkward pose here and there, the colors have likely faded, and yet, and yet ... look at them! These are not kings, none of them Tutankamen, and yet there is majesty, here ... if you are near the Getty Villa, the Louvre, or any other collection, go and see them ... they have waited a long time. And Alice said -- wasn't it obvious -- "we're eating the Cezanne." 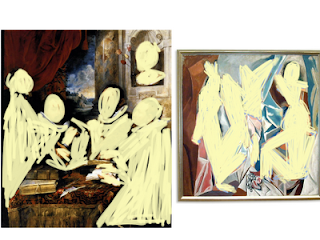 "Cubism has become a monument...."
There is no denying that this is a beautiful thing. It's the arrow shot from Cezanne's bow. But when you read Francoise Gilot (Life with Picasso) on her conversations with Picasso about Cubism ... she reports that he dismissed it as an important era in his art. Really. And she is VERY convincing on this point. Not long after I first read her book, Picasso appeared to me in a dream. He said to me, in a tone that was urgent and agitated, that "Cubism has become a monument. It must not be a monument." When Picasso stops by to converse, I always listen ... and try to determine what he meant. And so I turned to Gertrude Stein, who sat for her portrait with him (for 90 sittings) as he was turning from the harlequins to the Demoiselles. No-one converses with Stein and comes away unscathed, artistically. Stein would develop a distinction between what she called human nature/identity and the human mind/entity. Identity is pleasurable for the artist, and seems lovely at first, and results in art created for money or reputation, totally dependent on an audience (for whom the art-work or prose was very likely painted or written). But the real thing, entity, is art that is "not necessary," and is not based in memory or reproduction, but in writing "what it knows." That, she would say, is the real thing. When I saw was confronted with Picasso's statement in my dream ... that monuments were not so wonderful, I aligned the monument idea with Stein's idea of identity. It is art made for reputation, money, audience. Or it is a great hulking piece of marble, remembering an event or a regiment. And so, it is sad, it is past, it is a label, it is fixed, it is finished. Here, someone was born, or celebrated a victory, or died. Monument. Art should have no truck with monuments. Picasso was telling me (or I was telling myself, as I slept) that Cubism was at first a series of exciting and bracing and unprecedented discoveries, with Braque, but then ... once it was "done," it was done. Like a Jackson Pollock, it gets imitators, but it is, itself, a done deal. "Look, we have come through'"said D.H. Lawrence. An archway allows for this moment, for growth, for passage on to the next phase, for optimism in the face of fear, for art. And gaze at the moon until I lose my senses..." (from "Don't Fence Me In," written by Cole Porter, who went to Yale & Harvard Law School and lived in Paris, Venice, New York and Santa Monica, none of them places most cowboys traditionally roam... still, it is my favorite cowboy song). My brother-in-law was visiting from Australia; he is an insanely talented painter and print-maker and is looking to return here to teach. While he was here, we three talked about: etching using zinc plates, painting at the kitchen table, his coming around to Matisse, diabetes, family, living alone, beaches, and we debated whether art should be taught as though the paths taken were as inevitable, and single-minded, as the unrolling of a long carpet, and we sang songs by Dan Hicks and the Lovin' Spoonful and Pure Prairie League (that would be "Amy, what you wanna do/ I think I could stay with you..."), the Allman Brothers ("Whippin' Post"), and any other song that echoed anything anyone said. and looked, yes, again, at the pear and river painting ... I have worked on it, yet something is wrong. So I have turned it upside down to find the spatial weaknesses ... "until I lose my senses..."
The inspiration was a passage by W.G. Rogers, on traveling near Nimes with Gertrude Stein and Alice B. Toklas: "Across a completely charming countryside where the air had the tang of ripening fruit, and where white, chalky soil burst in brilliant splashed through the vivid, sometimes dazzling, green of the foliage." You do see... you want some, but not too much, of that dazzle. peonies in a box, late, dying, a sign saying "5 STEMS -- $12.99"
" ... the omitted part ..."
So much confidence in a pear. It is itself, except in Cezanne's hands, when it becomes his pear. Every apple, every pear, needs to shake itself free of Cezanne. Stevens's pears will not "resemble"; they will control the flow of their colors until the colors appear to blossom. These pears will never be eaten, because they are in a poem. We think we see the outline of the pear -- but then, only then, afterwards, do we recognize the full pear. But, as Stevens also said, "The imagination does not add to reality." I think he means that the imagination can show us ... the seeing of reality ... we must seize this moment and this picture as we see it forming in our minds; paintings and poems come from this seizing of just this glistening of a pear. I was looking at a series of paintings from 1994, a series I never exhibited. At the time, I was struck by a feature of most formal portraits that I have never seen anyone discuss at all. When Ingres painted the Princesse de Broglie in 1853, for example, he takes care with her face, and yet ... he takes far more care with her silk dress and bustle, and with the lace on her sleeves, even with the upholstery on the divan. I think that one could argue that this is proving one's worth as a painter; if you can paint a rounded, gleaming pearl, you can paint anything. It's something of an artist's resume, the velvet, the silk, the fur, the amethyst. But what of the face, when there is so much detail in the fabric and the jewels? On November 19, 1988, my husband and I saw a production at The Public Theater in New York that kept us talking for the full three-hour-drive home, and most of the next day, and for days and weeks after that. The play was What Did He See by Richard Foreman. We began to track down all of his writings; my husband was writing poetry and experimental dialogues and I was painting, and his complex ideas, we thought, needed to be felt, taken in, understood, and acted upon as we worked. In his "Ontological-Hysteric Manifesto I," Foreman talked about art and life and a thing he called "the scanning mechanism" which "produces art ... when its rhythms dominate the scanned object." [I should note that, as far as I can remember, this was well before the words "scan" and "scanning" referred to anything with a tiny, pricey chip]. Instead, Foreman is talking about the way the mind and the senses of the artist look, then take in, and repeat the action, and take in again, and thus "dominate" what is seen by focusing, instead, on the process, its movement, and what it says about our creativity and ourselves. Art, he says, should "give courage to oneself and others to be alive from moment to moment, which means to accept both flux ... and an INTERSECTING process -- scanning -- which is the perpetual constituting and reconstituting of the self." Accepting change is one thing... Foreman wants us to seek change, flux, interchange, and in this way wake ourselves to what matters, to movement and art and to recognize "imbalance," which we "most deeply" are. because that working out of who we are against what we see is critical. Foreman says that art should expose us to "the true process of a certain kind of sentence-gesture (man's inner quest for style, for a way of being in the world) as it encounters the resistance of the real object (nature)." We see something, we imitate it, or draw it, or speak it, we "scan" it, and the natural object... is up against what we see, say, draw. It doesn't change. We do. The art shifts to explore this, and we live ... more fully. He suggests, then, in a work called "How to Write a Play," that artists have a job: "find the heretofore un-mapped, un-notated crevices in the not-yet beautiful landscape ... and widen the gaps and plant the seed in those gaps and make those gaps flower ... and the plant over-runs the entire landscape." The thing that everyone draws, the thing that we always see, or respond to, the easy story, the thing we know ... those are not important in art and life, as we can sleep-walk our way through them. We want to find the things we have not yet seen, the hidden, the behind-things, the hints and "crevices" and we want to throw our lot in with all that we have not already known. Richard Foreman has his own website, www.ontological.com, where he lists upcoming productions and opens his notebooks. Go look at it, and then tell me what you find there.... We still love his work. ... aren't they? Image and text are very closely related ... made of lines placed at precise intervals, the hand holding, perhaps, the same pen with the same grip, forming a letter or a blossom, a word or a horizon ... very much the same. And yet, Freud wrote, in Civilization and Its Discontents, that "it is precisely communities [or elements in a book or on a page, I would add] with adjoining territories, and related to each other in other ways as well, who are engaged in constant feuds and in ridiculing each other .... I gave this phenomenon the name of 'the narcissism of minor differences' .... We can now see that it is a convenient and realtively harmless satisfaction of the inclination to aggression, by means of which cohesion between the members of the community is made easier" (London: W.W. Norton, 1989, translated by James Strachey, p. 72). It sounds as though admitting "same-ness" would actually diminish the possible cohesion within a group, because it might mean the loss of the individual, the self ... wait ... wouldn't that make it easier to bond? Well, Freud says no ... I think he is suggesting here that small, "harmless," controlled aggression can actually increase the thing that is equally "harmless," that bit of narcissism that allows us to feel ... just a bit different. No two soldiers or schoolchildren can ever be mistaken for one another, no matter how tailored the uniforms. In fact, the uniforms (like the similarities in the faces in that I mentioned on 4/26, the faces of the Amsterdam Musketeers) actually help us see the distinct expressions of a person's face. If we realize that people are, in these 'minor" ways, different, we ultimately come to respect them, I think. So it must be with image and text. The "narcissism of minor differences" can enrich us. Since each is composed of lines, what lines can we draw between them? What lines within each reach out to the other? Yesterday's excellent Print Fair, at the San Jose Institute of Contemporary Art (SJICA), presented selected artists who make monotypes; it was a beautiful day and we had time to meet each other and see one another's (sometimes very different) styles of print-making. I enrolled as an Art Education major when I first went to college. I didn't really understand what college could teach me about myself and about the world, and in the absence of any real understanding, I hoped to train for something. I took the first required drawing class in college. We had undergone the usual torture-by-still-life (those center-of-the-room assignments where we all drew a rocking chair, a teddy bear, a tinfoil star, a bit of plastic wrap, a leather-bound book, a light bulb, a mannequin's hand, a cereal box, whatever was smooth or rough or shiny or silky or transparent or fuzzy or wooden or weird... it was only a test, but it was every week). I believe I was assuming I would learn draftsmanship (which is what it was still called then, in the dark ages). When we were given our fist real assignment, weeks into the term, which was (in its entirety) "draw a window," I was excited. I sought out the perfect one: a frame that had come loose from its moorings, a window-pane with a delicate crack, traces of scrubbed-away wallpaper. I succeeded, I was sure, in reproducing its 1910-or-thereabouts feeling. My charcoal-ed panes looked like real glass. I added a chair under the window. Looked like wood to me. I glued on some printed paper to help establish the remnants of wallpaper. The critique was, then, going to be an event. We came rambling in, each of us push-pinning our final pieces up in a left-to-right row along the wall. I was feeling good; this was not a normal feeling for me, as I felt my fellow students were all, basically, Albrecht Durer on his best day. Then SHE came in. She unrolled her drawing and pinned it up. Yes, it was a window, an old, wood-framed, slightly off-kilter window. But, more importantly, she was the only person in the class to have realized that it might be useful to allow the viewer to see something through the window. The rest of us had been so preoccupied with getting the glass right that we ignored the view. And her view was, it must be said, a perfect squirrel. Every little line of fur was distinct; there were shadows on his chest, there were gleaming eyes. To quote a Keats letter, "the creature hath a purpose, and his eyes are bright with it." Not long after, I became an English major. And I earned another degree in English after that one.I made these decisions while thinking about the perfection of that student's drawing. But the fur, the eyes, the acorn between the squirrel's paws... none of that, in the long run, was important. What was important was that a window is to see through.